Some of Our Many Success Stories! "She has been such a massive help for us in such a short space of time. 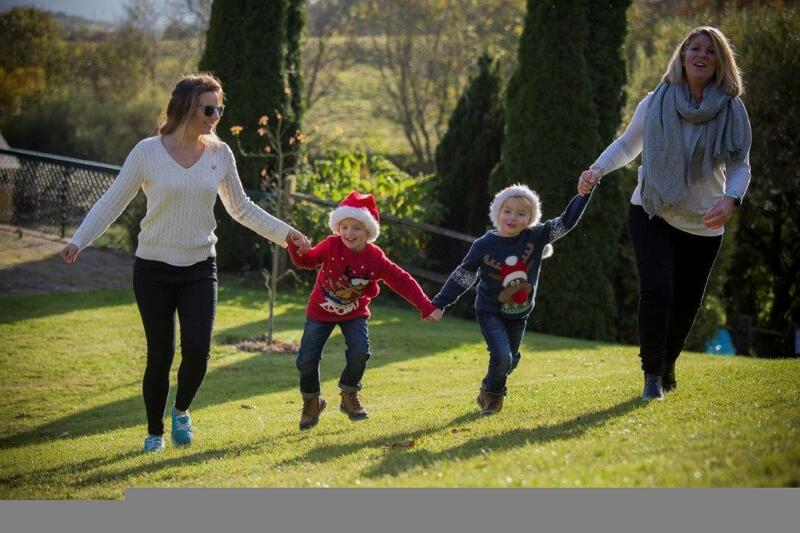 Thanks"
We are lucky to hear about everyday success stories each day, when we catch up with our current host families and au pairs during their time together. 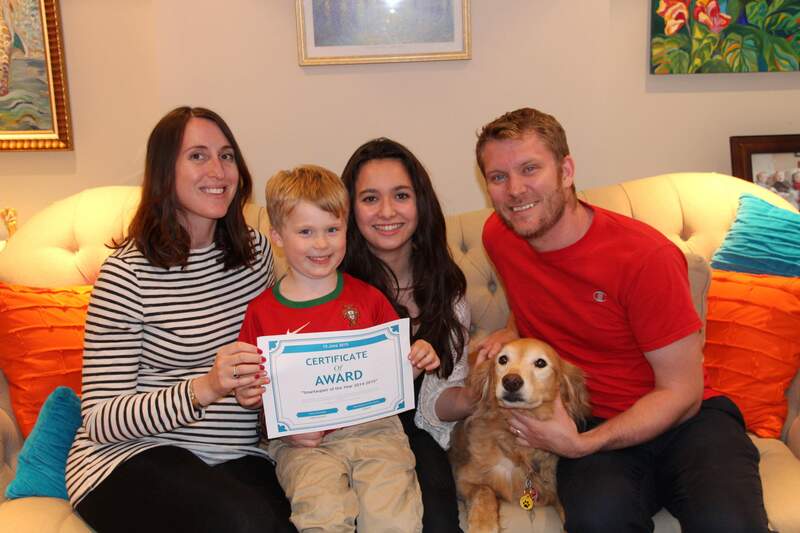 We hope the below lovely stories will highlight how neither the host family or the au pair effort goes unnoticed! 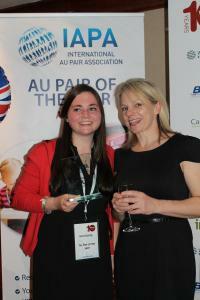 Au Pairs on Why Their Host Mums & Dads are Great! Noemi joined our family in September a few months after we located from New York to London. We were all still struggling to adjust to life in London, and prior to our relocation we had never had an au pair or any kind of live-in support. As a result, we were not the best at articulating our needs and expectations. New herself to London, Noemi set out to help us adjust. Most importantly, she took it upon herself to make sure she sought out opportunities for Ethan. 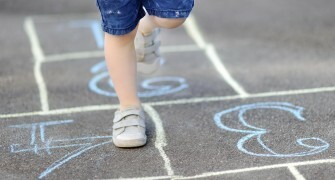 She made an effort to engage with children and parents at Ethan’s school, arranging play dates. She thought up creative ideas designed around the school curriculum and Ethan’s interests to entertain Ethan, including designing a flower project given Ethan’s loves of the garden, teaching Ethan Spanish, arts and crafts, baking, and so much more. (See attached photos). She has helped Ethan’s confidence grow day by day by encouraging him to keep practicing. When Ethan first arrived in London, he was reluctant to engage with other children, especially children he did not know. He would wait in line at the park for all of the children to clear from the slide before he tried. Just today, he proudly walked into a summer camp, which Noemi helped find, without knowing any other child and turned to Noemi and said, “I love you; you can go now.” Noemi has done all of this for Ethan while still looking after us in so many ways. She knows that I am a terrible cook, and often surprises me with dinner, especially if my husband is working late. She shops for my favorite things, always making sure that things are refilled before I even notice. She walks the dog (and treats her like a queen), because she knows we can use the help – not because we ever had to ask. Really, everything Noemi does that makes her so special, is just because she is Noemi. We are going to miss her terribly when she heads off to school in the Fall, but she will always be our best friend as Ethan says. Thank you for considering Noemi for this much deserved award. It’s funny how people that were completely strangers to you, can turn into your second family in such a short time. That’s what happened to me with Ethan, Amanda, Shaun and Wrigley Raad. I’ve been living with the Raads for less than 10 months and we went through a lot together: I cried and laughed with them, I learned a lot about their traditions, about their country, about childcare and even about myself. The amazing thing about the Raads is that they don’t treat you like staff. They let you your space and invite you to join them on days out or on special occasions. They include you in conversations that are not about Ethan, they don’t treat you like a child, they ask for your opinion about things and listen, they care about you and know when you need time alone. The Raads are funny, caring and full of love. In all this months the Raads not only helped me with my English, but also taking hard desicions, and realising what I want and what I don’t want. They have supported me in every little thing and they never judged me. I’ve grown up so much and that’s all thank to the Raads. If there was an award for the best host family of the year, the Raads would win it every single time. Ethan Jaxson is the cutest kid on the planet. He’s funny, sweet and adorable. When I arrived here, Ines (the previous Aupair) just left and Ethan liked her so much, that I was really worried that he would have a hard time and he would hate me, but that’s not Ethan. He played with me from day 1, was always asking me questions and loved to try new things with me. We enjoyed exploring Fulham together, going on picnics, reading books in the library, baking new recipes, trying different kinds of food, fingerpainting, having our own inside jokes that nobody else understands… It’s true that it wasn’t always easy and that we had our ups and downs, but, through it all, he’s my favorite 4-years-old boy. In the time between interviewing prospective Au Pairs and the start date, my husband and I separated, though have had to continue living in the same property. Enter into the family Irene from Holland. At eighteen, she embarked on an adventure and also a potentially difficult situation, challenging for those of us with far greater life experience. Irene displayed, from the outset, a fantastic maturity. She has coped admirably with a difficult situation, coping with angry and upset children, supporting our parenting and never losing sight of the reason she joined us – to provide quality childcare and enjoy a cultural exchange. I have been constantly surprised and delighted by her innovativeness. I returned from work to find Irene had made 24 ‘Cookie Monster’ cupcakes with the children, and on another occasion beautifully coloured macaroons. Irene takes the children and dog for long muddy walks, sometimes through parts of the woods where I’ve never taken them before. She genuinely enjoys ‘inset’ days and school holidays, as she can spend quality time with the children. Irene regularly produces little ‘treats’ and motivators from her room, hidden away from when she first left Holland. These small gifts are well thought out, and are used to reward and encourage good behaviour. Together we have put together a reward chart, but it was Irene that suggested the ‘big’ rewards should be one-to-one time just with her – which all three children has now enjoyed tremendously. A Saturday shopping trip to town (sacrificed from her free time), with coffee and a cake, and a chance to meet other Au Pair friends is so exciting for a small child! Irene has been challenged nearly every day with difficult behaviour from one child or another, but has retained her sense of humour and commitment to all three of them. There have been occasions where I have spent time coaching and mentoring her within her role, discussing how she has tackled situations and likely consequences during this development time for her. There have, however, been other times when she has (rightly) challenged the way I have reacted to events. She earned my respect very quickly by the way the way she ‘upwardly managed’ me at times – with sensitivity and maturity, always focussed on the best for the children. She completes her designated duties without reminder, and then looks around to see where she can add value to family life. She has taken on the care of family dog – she would love to have a dog, and so instead dotes on ours; feeding, grooming and exercising her. Irene’s place in the family has become a strong and calming force, and she has contributed to the family immensely. Now preparing for the sale of the family home, and the potential disruption of moving schools and areas, Irene has supported my position and that of the children at every turn. She is un-fazed by the thought of moving away, rationalising by saying that she is here to be with me and the children, regardless of where we live. The knowledge of this support has comforted and helped me greatly on the journey forward. When initially employing an Au Pair a couple of years ago, I anticipated some of the things to come – the relief of flexible childcare, the cultural benefits to the family, the fun of having a young adult in the home, the bond the children would establish, the good days and the days when it didn’t work out so well. What I hadn’t thought about was how, with the right person, my life could be so much easier and so much more fun! Across the cultural and age gap I have forged a strong friendship which will endure for many years to come. my family and I would be there for the kids, so I decided to continue. My first two weeks I had the children for the whole day, because they were on school holidays. with each other, but there’s enough time to make up and to start another project. hard. I have learnt to anticipate when times might be difficult, and try and head off problems. things aren’t great, but I try to stay focussed on the reason why I’m here: the kids. Trine is from Denmark and she joined her host family autumn 2015. We first met Trine over a Skype interview. We knew straight away that she was the right person to be a part of our family. As we were new to the au pair system, we invited Trine over for a weekend in London to experience some time with our family and to see some of the London sights. From the get-go, it was obvious that Trine was going to fit right in. The boys immediately warmed to her and were fighting to be the one to hold her hand. We have 3 young boys, so our family life is hectic, busy and at times very noisy! My husband and I both work so we knew that the au pair role in our family was going to be demanding. It has been so wonderful to know that Trine has everything under control whilst I am at work. When I come home, everyone is home safely from school (a 1 km walk away), laundry is done, beds are made, toys are tidied, the children are fed and everyone is happy! Trine is always on hand to help out with the madness of bath / homework / bedtime. It’s difficult to give attention to all 3 children at the same time. Trine takes that pressure off by playing games like ‘hide and seek’ with our youngest, or helping with reading and homework for the older boys. This means I can focus some time on each of the children. This is what makes a truly great au pair: allowing parents to enjoy every moment with their kids, rather than focusing on all the chores that need to be done. This year, with Trine around, I’ve even had time to volunteer as the PTA rep for my son’s class, giving me the opportunity to meet other parents and develop a better understanding of the activities at school. My husband often works late, and it’s been wonderful to have company in the evenings when Trine and I share dinner and chat about just about everything, or even watch ‘girlie’ programmes together. Trine is always responsible, positive, flexible, reliable and always willing to help. She brings a sense of calm, happiness and love that makes everything run smoothly. Trine has been an amazing support to our family and has shown maturity beyond her years. We have such a wonderful relationship with Trine, she is most definitely part of our family. And most importantly, the children adore her. They kept saying how much they missed Trine when she went home at Christmas time. Trine acts as a big sister to the boys – much needed in a predominantly male household – but also fulfils the role of oldest daughter. We care tremendously for Trine and we know she feels the same about all of us. Trine adapted to life in London and the UK seamlessly. The pace of life in London with a busy family can be overwhelming, but Trine has taken it all in her stride. Trine has shown incredible courage and an ability to tackle things head on. Within her first month, Trine made huge efforts to develop friendships with au pairs that she met through school and the local au pair network. 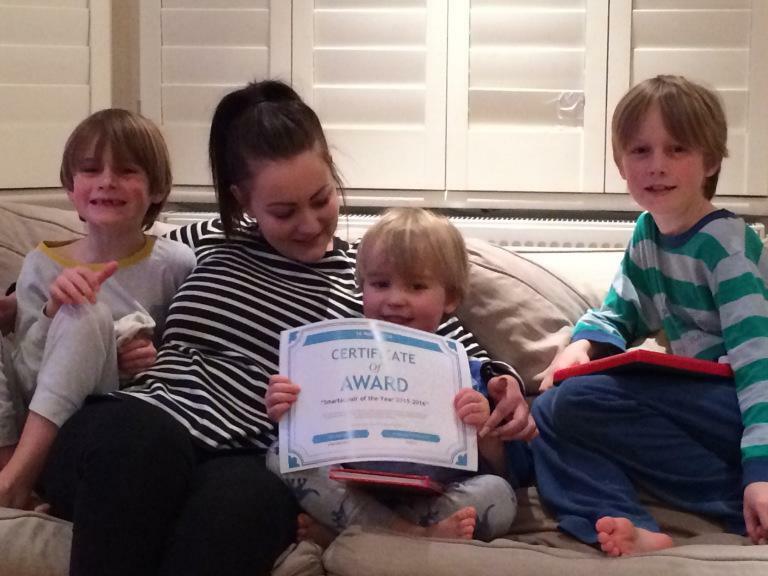 Trine was invited to write a blog describing the journey of an au pair from day 1. 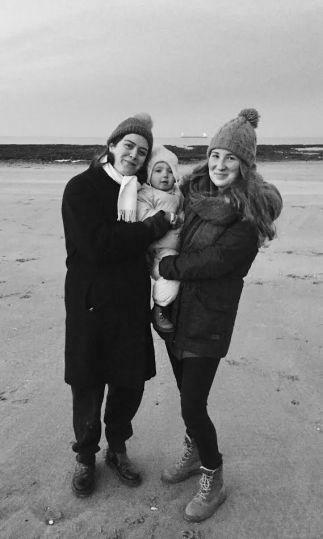 Trine’s blog is full of useful advice to help new au pairs from Denmark settle, including how to avoid homesickness and how to make sure they integrate quickly into their new home and culture. It’s clear from the way that Trine settled so well that she has much to offer to newcomers. Trine has introduced our family to Danish culture. On arrival, Trine won everyone over when she arrived with thoughtful gifts for the children including a picture book with words in Danish. Trine explained to the boys that Lego is Danish and with that, they were smitten! She brought traditional Danish treats and often cooks Danish meals for the children – ‘Frikadeller’ is their favourite. It’s been a wonderful experience to share Danish culture with Trine, and in exchange to share our own British and French cultures. For example, Trine has been excited to try some new foods, and as big foodies, we are keen to share these experiences with her. Trine is always there for the important events in our family including the first day at school, school and Christmas plays, and birthday parties. We have enjoyed visits from Trine’s family, including her dad, brother, uncle, aunt and cousins. We always want them to feel at home in London, so they are always welcome to stay with us. Trine will be coming skiing with us this March and we really hope she enjoys spending time with the kids on the slopes. It’s wonderful to share these family memories with Trine. The fact that Trine has become such a treasured member of our family is an amazing bonus we did not expect from the au pair programme. We very much hope that Trine will continue with us for a second year, not sure how we will cope without her! I’ve always been told, that family is where life begins and love never ends – and that’s why I’m 100% sure, that the Shepherds have become 5 new family members to me. 6 months ago I arrived in London with a thought that this year would be nothing but a job to me – but honestly it became everything else than just a job. When I first applied for an au pair job, I never imagined I would end up with a family I truly care about and where all 5 members care tremendously for me as well. The amazing thing about the Shepherds is, that they make you feel safe. The parents are very concerned about you, and want you to feel like; you’re a part of this family. They include you in everything, but at the same time, they value that you have your own time to do what you want, with your own friends. They care very much about you, and take you in as their own daughter. Alex and Pete have been unbelievably supportive, and when I’ve had horrible experiences, they’ve done whatever they could to make me feel loved and safe – and for that I am so grateful. The boys I’ve been looking after is 3 young boys with a lot, a lot, a lot of energy. We’ve had so much fun, and every night with the different games, cuddles and laughs – is what made me feel like a part of the family, and not just a staff. Every day when we walk home from school, and they all fight to tell me about their day, those are the times that makes me feel so appreciated and loved. I don’t think you can find 3 boys who are more loving, fun, energetic, exciting and wonderful, even if you looked all across the world. When I arrived one thing was particular important to me; and that was to be open-minded. Having in mind, that it takes time to bond and to create a new life in a new family. I had to make an effort – seek friends myself, and not just expect them to come to me. Before I knew it, I had a lovely network and a lovely life here in London with the Shepherds. Even though I still have 6 months left, I feel empty whenever I’m thinking of my life without this family. I hope and pray for, that I will carry them in my heart forever, and that they’ll always remember this year and the experiences we’ve shared, because I know that I will. Now up to date in the household, we’ve just welcomed a puppy called Narla, she is REALLY testing all of us at the moment, but I have no doubts that we can handle anything now. I am very keen to see what this last year brings, but I’m also very sad that I only have one year left with this absolute goldmine of a family, I’m so glad I picked this family and would do it again a million times over! We know from the moment we met her at the airport that she was God sent. It's so nice to look back and to remember my first days with my host family. The whole family came to pick me up from the airport last summer. Grace (now 5 years old) was holding my hand straight away when we were walking to the car. We played a lot of games on the car journey home and I felt instantly very comfortable being around the family (which hasn't changed ever since). Why my hostmum is the best hostmum! From the first day when I arrived, my hostmum was really welcoming and friendly (my hostdad was too, I will just not mention him in here because it’s about Mother’s Day, but he would definitely deserve a hamper too! :)). I have visited my hostfamily for a few days in October before I came here in December, and I already knew this is the right family for me! This short visit was to get to know each other and right away I felt like I have known them for ages. They were literally welcoming me with open arms! 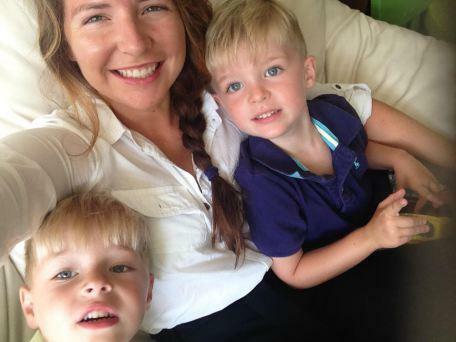 I am their first Aupair, but they make me feel really comfortable in their family! They treat me like a real family member and include and integrate me in almost everything! And that is what was really important for me when I chose my family! Once she called me ‘her big daughter’ which describes our relationship pretty good. I am like her two personal helping hands standing next to her all the time what ‘an older daughter/sister’ would probably be too! If someone asked me to describe my hostmum in one word, I would definitely say ‘superwoman’! Not only that she is having a 23 months old girl and two little twin girls; they were born three weeks ago and already now she looks amazing! But also that she still keeps managing everything even when it’s a really stressful and tiring day. Of course there are days more exhausting than others, but I know that we are all pulling together to make the best out of it everyday (especially for the little ones)! My hostmum is only ten years older than me which is pretty cool because she is more like a friend than like an authority person! We enjoy having film nights with chocolate and ice cream and talking about any new gossip. Moreover, I can always talk to her (and my hostdad) about everything and I always know they are listening! Her name is Mercedes which is spanish and means ‘compassion’. You can interpret this as ‘being concerned of’ or ‘being interested in’ others needs and I think this really suits her personality because she is always there for others if they are dealing with any kind of a problem or having any concern; it doesn’t matter if it’s her family, friends, me or maybe even a stranger, she always tries to find a solution! I also want to mention (because I think the following is not self-evident!) the little things like asking how I am every morning or saying thank you for all of my work in the evenings which makes my hostmum/hostfamily the best hostmum/hostfamily I could ever asked for! All these reasons make me feel like home, remember me that my work is appreciated every day and confirm my decision to live as an Aupair in England with a total stranger family in the beginning, but turning out to be my second one! As soon as I saw that you could nominate your host mom for Mother’s day I just knew that I had to write to you about Isabelle. She is such a loving person always doing her very best to make everybody else feel good and make everybody else’s life easier. So I really think that this time someone should do something for her. She definitely deserves to win because she is not only the best mom for her to kids but she is also the very best host mom. I can always talk to her and it is so nice that she is sincerely interested in me. She’s interested in my personal life in Denmark but most certainly also my life here. She always makes sure I feel welcome if they are going somewhere as a family. Even when she is having a bad day or is very stressed she never lets it out on us she still makes sure to do what ever she can to help the children. She is always so sweet, helpful and glad even when she is having a hard time herself. I can have very personal talks with her and just as I talked with her about the other day even though I have only been here for a bit more than 2 months it feel much longer because I’m already such a big part of the family and everything just seems natural with me being here. She takes her job as a mom very serious but she is also very good at it. So a very big and beloved thank you to you Isabelle not only for opening your home to me but also your heart! I will be forever grateful for you having me here. When I saw this Mother’s Day Special, I knew exactly that my host mum Kerry deserves this 100%! After our first (and only) Skype Call, I knew right away, that I would love to work with this family and I was so happy, when they thought the same! From the day I arrived, my host mum made sure, that I felt welcome and part of the family! She’s here for me no matter what, and I know that I can talk to her about everything. Even though she’s always really busy with her job and organizing other things, she makes sure that I know what I have to do and is always here to assist me, when I need help with a recipe or other things. I think she appreciates what I am doing and now I want her to know, that I really appreciate being here with her and her family! She always makes sure that I am okay, or asks if I need anything before she goes shopping. My host mum is an amazing cook and an even better baker. She makes the best cakes ever! She spends hours doing them for friends, colleagues or family and really pours her heart into it, to make every cake different and special. She is always here for everyone and I think she deserves this little Mother’s Day special, because it’s time that she gets something back. I feel so welcome here and I couldn’t have asked for a better host family, and that’s mostly because of my great host mum (&host dad of course)! I would be so happy, if Kerry gets this great package and I think she would be happy as well! Thank you so much Kerry!!! Kathryn was my host-mum from summer 2014 until summer 2015 and she still is my hostmum in every way – even 439 miles apart! I just remembered my arrival at London Heathrow airport when she and my little boy picked me up and immediately made me feel welcome and home, I never even thought that any of these people could not be loving or caring to me in any possible moment. Just never! And it really never happened: If I had trouble getting somewhere, if I was homesick before Christmas or even if I just didn´t know what to do, they just jumped in and helped me in very way you can think of! I can´t tell you all the funny, serious or unclear chats we had about everything – always leading us to a very confusing but all-laughing conversation-end! Kathryn helped me expand my English to a level I never thought of – although it´s getting a bit rusty here in Germany again! But never mind because I know where to go to see my second British home! And I regularly do, because not seeing these lovely people would break my heart! My host mum Jo, she is a super woman! She is a hard working and a very busy woman, but always friendly and kind to me, to her family and to everyone. She is a lovely mum to two kids, a good wife to my lovely host dad and the best host mum and friend to me. Since my first day here in UK she has always been helpful, friendly, funny and a very welcoming person. She makes me feel very special and important. We can laugh together like teenagers and have a good conversation, but the best thing with Jo – I know she is always here for me if there is any problems, today and always. Even if she is very stressed or busy with lots of things to do she always takes time to help and share thought with me. I’m very thankful for my fantastic host mum Jo. She is a good role model and definitely a special super hero in my life. I know It’s so many great host mums in the world but I would love to give my host mum Jo the Waitrose Mother’s Day Hampe with lots of love for all the hard work and for everything she has done and still doing for me. Paula is a really SUPER MUM! She is on the go all the time, while she runs her own business, she takes care of everything else, cooking, grocery shopping, exercising, get involved in important issues, go to meetings, and also takes care of three sometimes four children plus a dog! Paula is really a great inspiration! And has been amazing since the first day I came here. She received me with open arms and welcomed me into her lovely home, and she has created a safe point for me here and I can call her home and her family a home, for a little while. That’s is something very important. I would love to give her this gift as a thank you for all the hard work she does! I would to introduce my hostdad: Peter. This competition is completely for him because is a very special hostdad. Peter is a fantastique cooker( he’s doing the best Chinese food, I had never eat in my all life) , a banking worker, the best partner to watch football on TV and an incredible dad with his children. When I came in England, he was waiting for me at the train station and he was the most smiliest person I had ever seen. He had always supporting me and always gave me a lot of advices for the life in London, my job and my English. Even, when he comes home late, he always come to see me and said Hello and How are you.Peter always treated me like a real member of his family, spend time with me( to talk, playing Xbox, watching tv) asking me if I’m alright and helping a lot when I was injured. His the best hostdad because went I broke my toe 1 month ago, I was on crushes and I was really sad, he had trying to make me laughed during all the day to make me forget what had happened to me.Just for that He is the best hostdad. I would love Peter received this present, to said a big thank you to him to be always really nice, funny and always supporting me :D.
"We have tried other au pair agencies/websites but always come back to Smart Aupairs due to the reassurance that they are only contacting us with the best people who have been fully checked out in their own countries. We also prefer the fact that we have support and backup once our au pair starts"